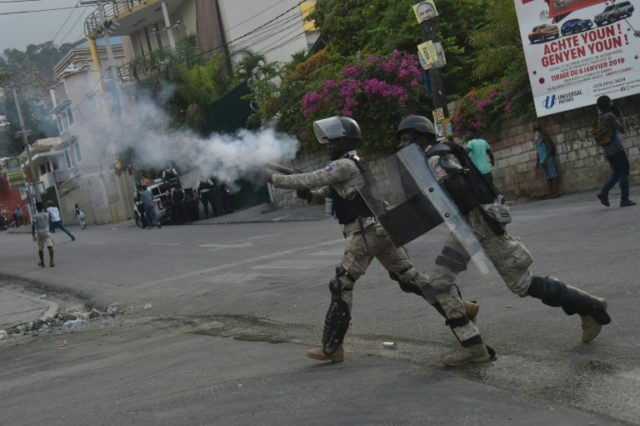 Police in Haiti arrested a group of foreign nationals, including five Americans, for possession of illegal firearms on Sunday as protests against corruption rocked the nation and President Jovenel Moise was pressured to resign. Prime Minister Jean-Henry Ceant announced on Monday the case has been referred to the investigative unit that handles organized crime. The foreigners were arrested while driving through Port-au-Prince in two vehicles on Sunday, armed with an impressive array of weapons. The U.S. State Department acknowledged the arrests but did not reveal any details about the individuals. Haitian media, on the other hand, named them and tracked down social media profiles that suggest they had military backgrounds and were working as security contractors. Christopher Michael Osman, Kent Leland Kroeker and Christopher Mark McKinley are all veterans, and are among the five Americans police arrested on Sunday afternoon, about a block from the country’s central bank in downtown Port-au-Prince. Riding in two vehicles, a Toyota Prado and Ford Pickup, without license plates, they were stopped at a police checkpoint and questioned. Inside their vehicles: six automatic rifles, six pistols, two professional drones and three satellite phones, police told the Miami Herald. According to the New York Post, a fourth American traveling in the vehicles was a former U.S. government contractor named Talon Ray Burton, age 52. The fifth American was later identified as 42-year-old Dustin Porte. A Russian, a Serbian, and a Haitian national were also traveling with the group. Some reports have indicated the “Russian” was actually another Serbian. Port-au-Prince police chief Joel Casseus said the men claimed “they were on a mission and they didn’t have to speak to us.” He said they clarified they were “on a government mission” at the time of their arrest. The Associated Press quoted a Haitian police spokesman who said that after police pulled over the two cars and detained the eight occupants, “a third car showed up with an unidentified man who pressured police to release them.” The AP also stated the first two vehicles lacked license plates. The Miami Herald identified the driver of the third vehicle on Monday as Fritz Jean-Louis, an adviser to President Moise. When police searched the first two vehicles they found license plates stored within, and one of them was registered to Jean-Louis. A local car dealer sent a letter to the Haitian prime minister stating that one of the vehicles was purchased by an unnamed former government official and put at the disposal of Jean-Louis, who has since fled the country. Haiti’s Attorney General Paul Eronce Villard said on Tuesday he has not been pressured to release the suspects despite rumors to the contrary. Villard went on to explain the two carloads of foreigners were pulled over on Sunday because they were driving without license plates and they are now under investigation for weapons charges. The group of foreigners arrived in Haiti after a week of violent protests against government corruption and skyrocketing inflation which included calls for President Jovenel Moise to resign. Moise refused these demands, saying his resignation would “leave the country in the hands of armed gangs and drug traffickers.” He offered concessions such as limiting travel and reducing the privileges enjoyed by government employees. He also promised to raise the minimum wage and reduce the price of essential goods, although he did not explain how either of these goals could be accomplished. Haitians may be skeptical of Moise’s promises, but they seem to be backing down from demands for Moise’s resignation, and life in Port-au-Prince is beginning to return to normal. The implication of the more ominous press coverage of the Americans arrested in Haiti is that they were some sort of black-ops squad sent to either remove Moise or protect him from the mob, although in the absence of any other information, it is much more plausible they were working as a private security team. The rumors swirling around the involvement of Fritz Jean-Louis suggest Moise covertly hired the group as a security detail, or perhaps to help him escape from Haiti when the protests were exceptionally large and violent. Jean-Louis himself floated a rumor that the group was on a mission to “evaluate” the central bank of Haiti, which is located only a block from where they were arrested. The Miami Herald dug into the backgrounds of the defendants and found that Porte runs an electrical contracting firm called Patriot Group Services that once did $16,000 of subcontract work for the U.S. Department of Homeland Security; Burton is the director of a security company and has both firearms and detective licenses; Osman once owned a tactical assault gear company and pled guilty to misdemeanor assault charges in 2017 for a road rage incident; McKinley also had “a few brushes with law enforcement in Ohio”; Kroeker runs an off-road engineering company that boasts of employing former military and police officers; and the Haitian who was arrested with them, 39-year-old Michael Estera, may have been deported from the United States.